In the past couple of entries, we have been exploring the golden history of Dahlonega, Georgia. 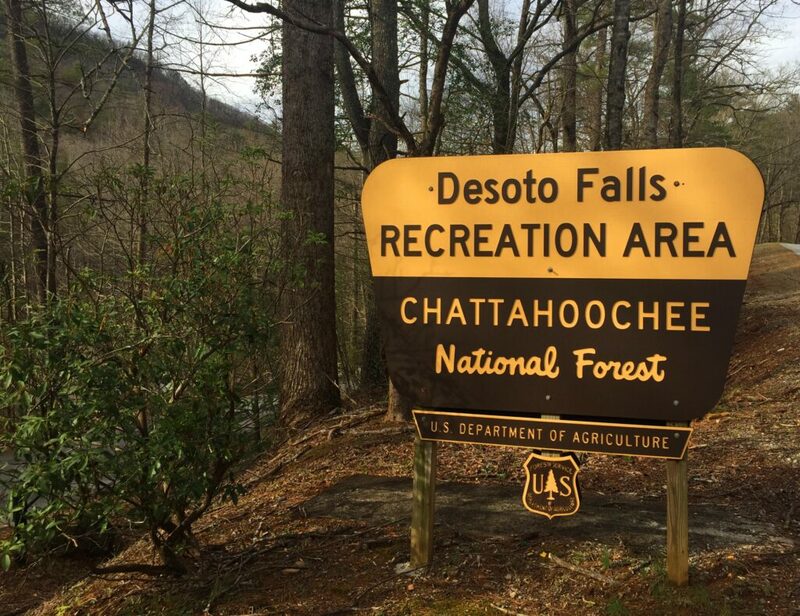 In this installment, we will head start heading north in our RV to the DeSoto Falls Recreation Area exploring other waterfalls along our route. 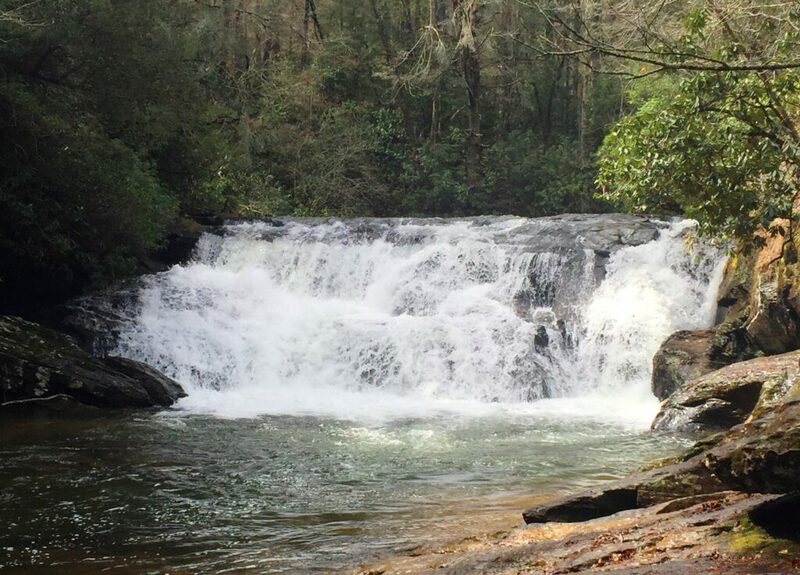 Our first stop is Cane Creek Falls on the northern outskirts of Dahlonega. The falls can be reached after a short walk from the visitor center. It can be viewed from above via a viewing platform or from below on a bridge crossing the stream. An additional bridge above the falls allows you to complete a loop around the falls rather than backtracking the way you came in. Next is Dicks Creek Falls. This series of waterfalls are right next to the road with little walking required to enjoy a good view of each. The falls are popular for wading and swimming in the summer. 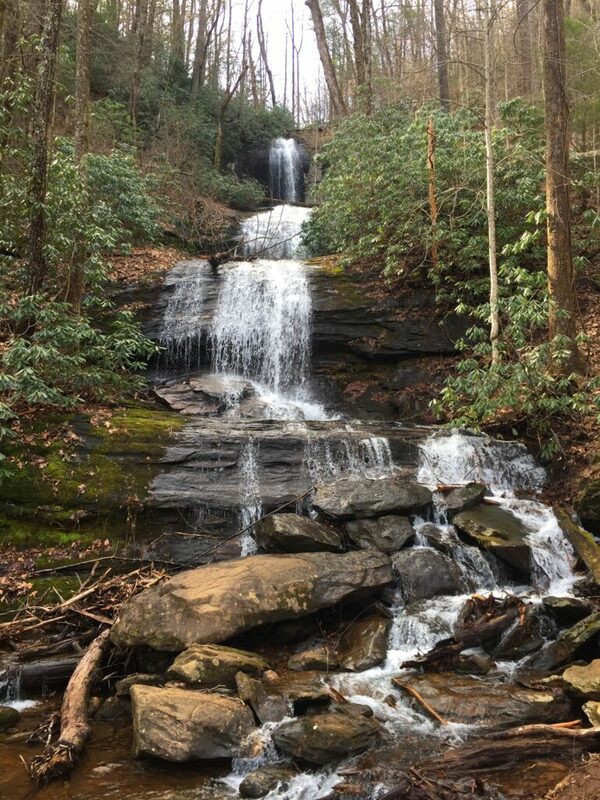 Just up from Dicks Creek Falls, we will reach our camping destination of DeSoto Falls Recreation Area where you can camp and enjoy a short hike to two more scenic waterfalls. Legend tells us the area received its name from a piece of armor that was found from DeSotos’ expedition through the area in the mid-1500s. 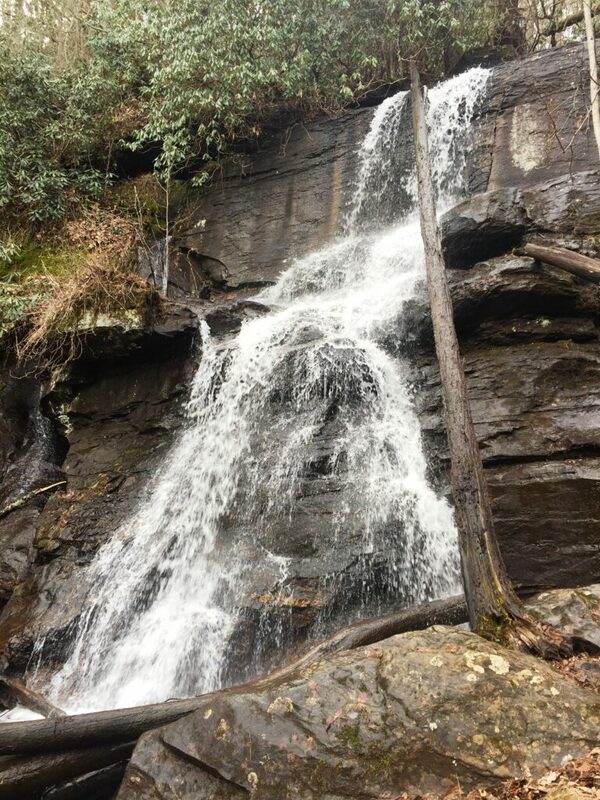 Upper and Lower DeSoto Falls can be reached via a moderate 2.2-mile roundtrip dog-friendly hike suitable for the whole family. Take note of the giant rhododendrons as you hike along the trail. Upon returning to camp, anglers will want to try their luck catching a trout or two in Frogtown Creek which flows adjacent to the campground. Hiking to scenic waterfalls from a campsite in the forest, just another great adventure in RVing. 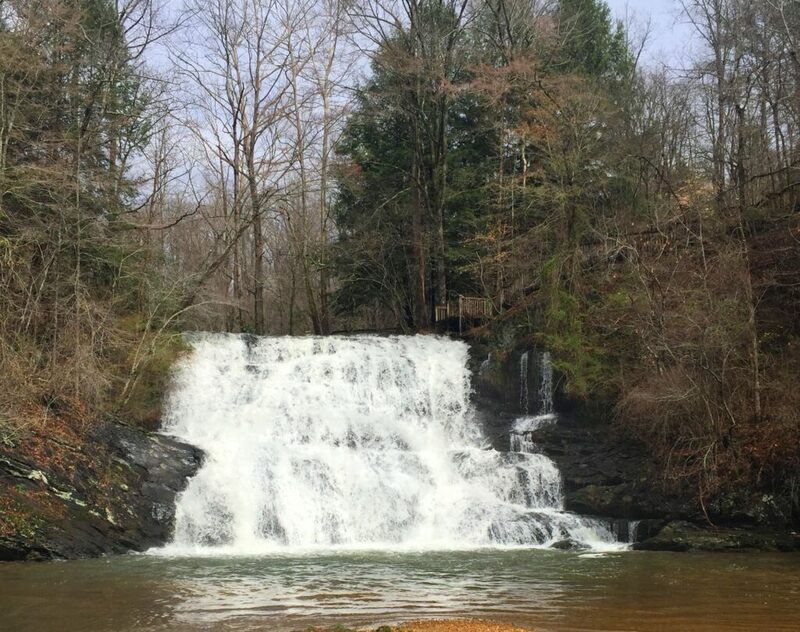 Cane Creek Falls is located on a private Christian camp. The camp graciously allows visitors to enjoy the falls during daylight hours when camp is not in session. Click here for driving instructions. Best to visit in your dinghy or tow vehicle due to the access road and limited parking at the site. Again, it is best to visit in your dinghy or tow vehicle due to the access road and limited parking. 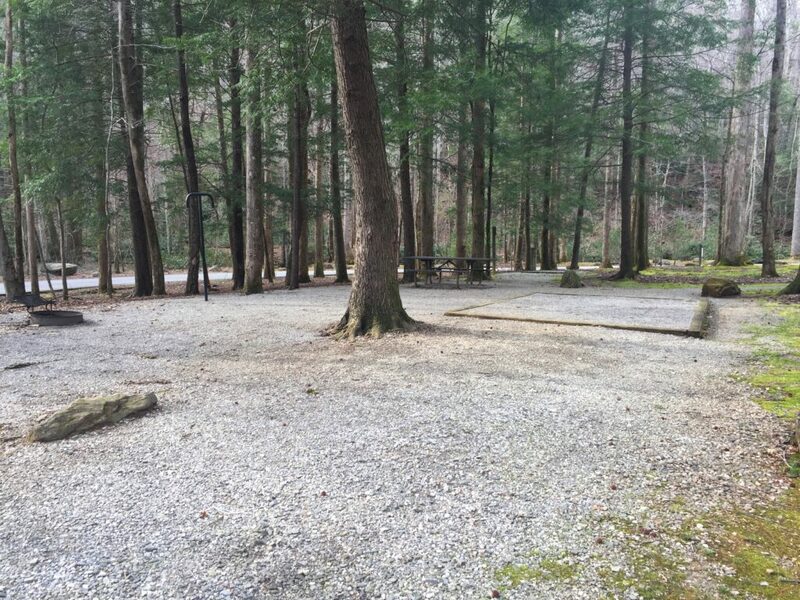 DeSoto Falls Campground offers forested campsites (some very spacious) along Frogtown Creek. Click here for more information on the campground and recreation area.